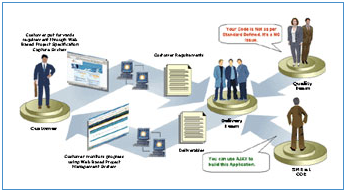 Nexsus has a well designed software delivery processes at its disposal. The process starts with Nexsus's web based Specification Capture Tool, which is used by customers to put forward software requirement specifications. The specifications are analyzed for Feasibility Study and preparation of SRS. The Delivery Team is guided by the SME from the Nexsus Centre of Excellence (COE) with regards to the tools and technologies that need to be used for the development of the application. Progress on the project is monitored live by the customer using a web-based tool designed by Nexsus to provide transparency and control to the customer. The Quality Assurance Group keeps tab of the conformity to coding and quality standards. Software Delivery Optimization is Nexsus's vision and solution strategy for maximizing the business value of software by transforming the unmanaged software development art form into a managed business process. A holistic solution comprising an application. Lifecycle tools platform, server-based infrastructure, process optimization, best practices and skills enablement, it is designed to accelerate information flow, collaboration and visibility across core organizational functions and key roles, while enabling predictability and manageability of the overall software development process. Software development leaders will be able to transform chaotic environments through greater process control, empowered by a 360 degree view of their current and future project execution capabilities across the application portfolio. Technology plays a major part in automating and enabling the software delivery process for speed and efficiency. The Software Delivery Optimization platform comprises a number of envisioned attributes that Nexsus is incrementally working on, with many elements already available today. These include: Real-time Visibility and Control; Process- and Role-Centric Productivity; Model-driven Development; Frictionless Deployment and Modular Flexibility Real-time visibility and control is about achieving extensive manageability and visibility of the entire enterprise IT project portfolio and their related requirements throughout the development lifecycle to drive better collaborative project selection in terms of return against development, maintenance and operational costs. This is established through comprehensive IT Project Portfolio Management (PPM)-for consolidated visibility and measurement of IT project progress including resource and skills allocation across lines of business. Additionally in-depth application metrics provide PPM dashboard capabilities that are extended through the collection of critical application-level metrics for real-time progress and estimation, such as code quality, reuse levels, volume measurements and artifact relationships. Combined with tightly integrated workflows for extensive requirements management capabilities that drive the requirements flow down from the business level planning and estimation phases into execution phases, this facilitates extensive enterprise-wide impact analysis and change management.